Nowadays almost everyone books their vacation online, as it is easier, faster, and above all cheaper thanks to readily available discount codes. Ebookers is one of the sites that make planning your holiday online very easy and affordable, with even more savings possible via the use of coupons and our Ebookers voucher code. The site includes a huge number of hotels, airlines, cruisers, train tickets etc. so that you are able to find everything you need for your holidays all in one place. 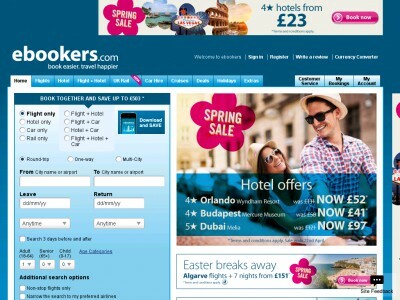 Based in the UK, Ebookers is one of the largest online travel companies in Europe. The company was formed in 1998, however its origins go back to the early 80’ when it was known by the name of Flightbookers Ltd. The company launched their interactive travel site in the UK, which became so successful that it separated to form Ebookers. Nowadays, the site is still gaining in popularity due to its low prices and huge selection, and belongs to the world’s largest travel conglomerate, namely Orbitz Worldwide, which owns a number of successful consumer brands including Orbitz, CheapTickets and Ebookers. Ebookers Voucher codes – How to redeem? Choose the service you want to use (e.g. booking a hotel of a flight). Fill in any required data. For example if you’ve chosen Flight + Hotel option, you need to provide your trip details, including the place you want to fly from, your destination, as well as the departure and return dates. You can also fill in the name of the hotel you want to stay in. You will receive a list of the offers that suit your description best. Choose the one that interests you the most. After you have chosen the offer, you will see the summary of your booking including all the services and the price. Click on “Book this package” button if you are satisfied with the booking. You will receive a list with the detailed description of your booking, including the flights departure and all stops, plane model etc. Then click on “Continue booking”. Now you need to provide detailed information about the passengers and request additional services concerning your flight or hotel stay, as well as the travel insurance. In the next stage you can choose the type of card you want to pay with and enter in your payment address. At the top of the page you will find the promo code link. This is where you will finally need your discount code. Click on it and fill in the box that pops up with your Ebookers coupon. Click on Apply & Reprice in order to see the amount of money you have to pay after the discount. Click on the Agree & Book button at the bottom of the page in order to confirm your booking, and submit all the data as well as the voucher code. Any location or package you wish to book can be purchased at a discount thanks to promo codes from our website, so be sure to grab yours before booking your dream flight! The discount is always calculated at the end of your booking, so start saving today! British Airways lures bargain-hunters with amazing coupons and discounts. But wait, that's not the end of it! In Travel category you will find plenty of voucher codes to shops such as Expedia, Opodo or Ryanair. 1.Select the products you wish to have and click on “Book Now”. 2.Choose departure, package, and passenger information. 3.When you are finished selecting products and extra services, click on “Continue Booking”. 4.If you are satisfied with your choices, then click continue to checkout. 5.Enter in your personal details. 7.Wait for your email confirmation with e-ticket and pack your bags! And don’t forget to follow Ebookers on Facebook, Twitter, Google+, Instagram, and Pinterest. After all, you never know what great discounts you might find next! Considering the great reputation that Ebookers has when it comes to making shopping easy, it should come as no surprise that they have designed their own mobile app that allows you to shop from the palm of your hand! Ebookers mobile apps can be downloaded for Android and IOS, so be sure and download yours today! Buy now online at www.ebookers.com. Ebookers.com is a website where I can always find a good deal on travels, but now I was able to purchase packages for cheaper than ever before using an Ebookers discount code! An Ebookers voucher code is the best way to ensure that you are getting the best price possible for that vacation you’ve always dreamed of, and thankfully, an Ebookers code can be yours for free! Saving on your next vacation is as easy as copying and pasting your eBookers promo code into a box, so why not save as much as you can for your next trip?